About 80% of internet users will conduct an online search of some type before they decide to make a purchase. 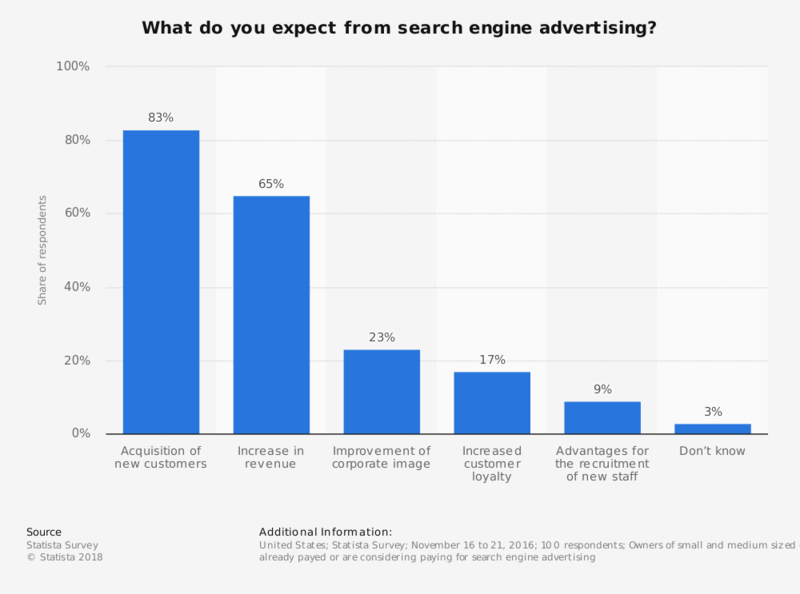 A majority of those searches will happen through a search engine like Google or Bing. Even if you focus on B2B marketing, more than half of the leads who reach out to you will have already narrowed down their list of potential purchases. That means your job is simple: close the deal by proving you can do what you said you could do on the search engine. The goal of a search engine is to help internet users find what they’re looking for when they ask a question. Even if a search doesn’t take the form of a question, that is what users are initiating. As a response, the search engine provides them with a list of the most valuable websites which are associated with that search. With search engine advertising, your site gets put onto that list because you’ve paid for it to be there. Before getting started, however, there are some advantages and disadvantages of this marketing option which must be considered. 1. You have multiple targeting options at your disposal. With a search engine advertising campaign, you have the ability to dial into ultra-specific demographics, keywords, and search opportunities to maximize your marketing budget. This structure makes it possible to target people in your core audience that are already searching for products or services that you offer. With strategic management, every click you’re able to generate should come from someone who is a potential lead. 2. The results are immediate with search engine advertising. When you pay for advertising on a search engine, your results will display on the first page, above the organic listings, when there is a match with your search options. That means it becomes possible to generate results immediately when this type of campaign goes live. You are able to get the brand message which you believe will be effective to the people who are already wanting want you have. 3. It may improve your organic search results. Because paid search options improve the amount of traffic your website receives, there may be a boost experienced in your organic optimization marketing efforts as well. Modern SEO is based on value. One of the markers for value that search engines watch for is an increase in traffic over time. With a campaign that is properly organized and maintained, this advantage is possible to achieve on a minimal budget. 4. You may experience improved name recognition within your industry. There are two results which are possible when using search engine advertising for your business: impressions and clicks. The clicks are treasured because that brings the visitor into your sales funnel to create a potential conversion. Impressions should not be overlooked, however, because name recognition is still important. If your advertisement displays at the top of the search page, then it will be seen. It could be remembered. With multiple name exposures, it is very possible that you could become a top-of-the-mind brand in your industry without having someone ever visit your site. 5. It gives you an opportunity to control your budget. Most businesses will use a pay-per-click (PPC) campaign when they first start advertising on search engines. There is one clear benefit in using this advertising option above others: you only pay for the advertisement when an internet user clicks on it. You’re able to set a maximum bid for display, daily budgets, and monthly budgets, which ensures that your campaign stays within your advertising budget at all times. 6. You have access to clear and understandable metrics. Search engine advertising generates a lot of data that you can analyze. When you combine this information with your personal metrics, campaign goals, and visitor tracking information, it becomes easier to know what is working with your advertising and what is not. You’ll be able to track key rates, like your ROI, with reports that can be generated in a click or two. With this information, you’ll know where you should put the bulk of your budget to push more people through your sales and marketing funnels. 7. It can be extremely affordable. Google released information from AdWords about the average cost per click across all industries, noting that it is $2.32 for each click on the search network and $0.58 on the display network. When looking at the actual costs, however, dating sites, e-commerce sites, and automobile sites are the clear winners, with an average cost per click of $0.19, $0.88, and $1.43 respectively. Travel, technology, real estate, advocacy, and B2B all came under the $2 per click level. At the other end of the spectrum, legal CPC rates were $5.88 and employment services were $4.20. 8. You can promote all of your competitive advantages. When you have a specific competitive advantage over your competitors, then search engine advertising makes it possible for you to promote that benefit. That might be an option for free shipping, a lower price for similar product, or even a service that no one else in your region offers. For many customers, that means you’re promoting your biggest strengths directly to them. 9. There are testing options available to you. If you’re not sure if an advertising campaign will work, then this form of marketing offers a distinctive advantage. You can test your creatives against each other to compare results. This gives you the chance to fine-tune each campaign to make it as effective as possible when targeting your core demographics. 1. This form of marketing is very competitive. If you’re doing search engine marketing in a niche industry with long-tail keywords, the competition levels tend to be low. When you’re in a competitive industry, however, and you want to target popular keywords, then you’ll need to have a budget that is large enough to help you make an impact. To reach their full potential, most large companies who advertise on Google and Bing hire SEO experts and PPC managers who work full-time on the data their results generate. For the small business owner, this can make it difficult to compete. 2. It requires specialized knowledge to be competitive. In theory, it is possible for anyone to start a PPC campaign or some other form of search engine advertising. You can learn as you grow, targeting different keywords, to experiment with results. That’s great if you have a lot of time and some money to burn. If that isn’t you, then you’ll need to bring someone in with specialized knowledge of search engine advertising to generate the results needed through the complex interfaces that are always part of the process. 3. You will need to make a strong time investment. It takes more time than you might realize to research keywords. Some sites may offer you lists of alternative keywords to target, competitor rankings, and overall traffic, but that isn’t enough to make a strong impact. You might find high-quality words with low levels of traffic that still receive enough to make a paid advertisement meaningful. Then you must keep tweaking the campaign, reviewing results, and testing your text and image creatives to maintain the best possible results. 4. What works today may not work tomorrow. In the world of search engine advertising and marketing, the major algorithm changes by Google tend to be what dominate the news cycle. When Penguin 4.0 came out in 2016, it changed how the SEO community approached marketing. The reality is that Google changes their algorithms up to 600 times per year, with most updates being small and often going by unnoticed. It takes a lot of work to stay up-to-date because with these changes, what works today may not be what works for you tomorrow. 5. Many search engine advertisements are not visual. Although you can get some product placement advertising along the sidebar of a search engine, most of the results you’ll create with a typical campaign are based on links and boxes. Consumers today tend to gravitate more toward visual content than text-based content, which puts this type of advertising at a disadvantage. If you’re a retailer who relies on product visuals to generate sales, then you may find it difficult to produce results, even if your sponsored content is at the top of the page. 6. Search engine advertising doesn’t contain a viral component. People are not going to suddenly start typing in a specific search term to see your website. Although you may be able to take advantage of viral traffic in some search terms, paid advertising of this type has limited value for some organizational goes. If you want your brand name or message to extend beyond the reach of your core audience, then placement is inferior to social sharing. 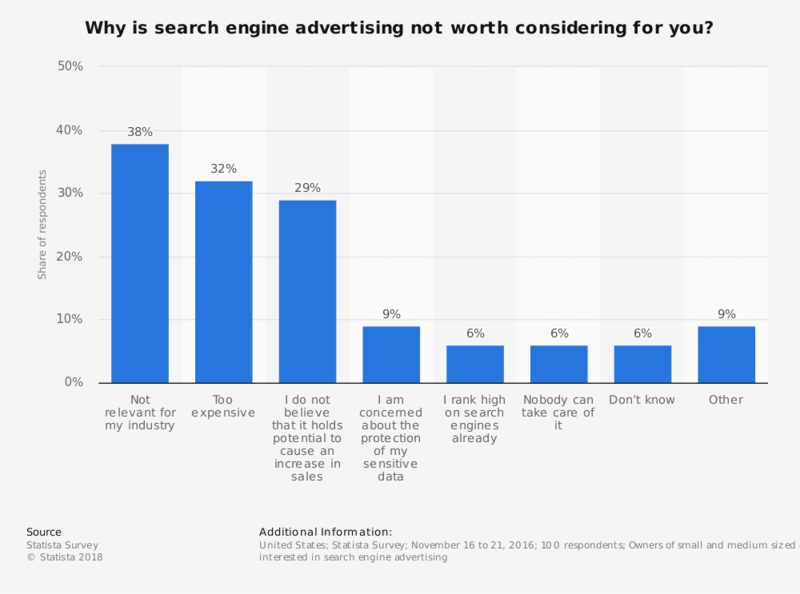 Search advertising does not offer an option to share content across online platforms under its current structure. At the end of the day, you must remember it is advertising, not marketing. 7. It is a long-term strategy which requires ongoing funding. You’re charged every time someone decides to click on your advertisement when you pursue search engine advertising. Even with strong budget controls in place, there are cost overruns built into some platforms that may push you over-budget. Every click, whether it is meaningful or not, comes at a cost to you. For some companies, it can cost a lot to stay at the top of their preferred search terms when the ultimate result tends to be a boost in overall traffic. 8. This type of advertising is clearly marked on search results. If you put in a Google search for almost anything, you’ll find that advertisements may fill up to the top 3 spots of your results. You’ll know this because there is a green box marked “AD” that is displayed next to the website link. Your visibility might go through the roof, but it is not a guaranteed click. There are internet users who specifically avoid AD listings because they’re looking for a specific result. Advertising doesn’t get you into the coveted answer box either, which will generate more clicks for some businesses than their advertising. 9. Your visibility is immediately gone. One of the benefits of search engine advertising is that your visibility is immediately present. That means one of the disadvantages of this marketing option is that it will disappear immediately once you stop paying for it. There is no residual effect with this type of marketing. If you weren’t found before, then when the money goes away, you won’t be remembered. These search engine advertising advantages and disadvantages show us that having a presence in search results is important for lead generation. Most clicks happen at or near the top of an internet user’s search results. A paid placement will make sure your company is in the running. At the same time, as with any advertising effort, there are no guarantees. The quality of your results will be dependent upon the quality of the professionals working on your campaign. That is why you must hire slow, fire quick, and be cognizant of personal limitations to maximize the potential of your search engine advertising.